In Part I we discussed what does engaging the audience mean and why is engagement required. Before we find out how to engage the audience, let us recap what engagement means. In Part II we will discuss how to engage your audience when you make a presentation. What should you do to get attention, maintain attention and involve the audience. We can learn from the book Made to Stick which talks about what makes some ideas sticky. The book talks about two emotions; surprise and interest. Surprise gets attention and interest maintains it. To surprise, you need to break a pattern. Unexpected, unpredictable events attract attention. Remember the New Zealand cricket umpire Billy Bowden. Do you think anyone who sees his 'actions' the first time will ever forget him? He does something totally unexpected. So how can you start engaging your audiences. In order to do that I propose what I call the '10 tools of engagement'. You can start using these tools right away. They are simple and are used by every good presenter. 1. Start well - An unexpected and solid start sets the tone of the presentation. Rather than starting with an agenda slide, start with a story, a problem or a visual. If you are proposing something new, write down a problem statement on slide 1 and then move on to proposing your solution. 2. Tell stories - Stories are perhaps the best way to get attention and aid recall (you cannot forget a good story). If you have a story, always begin with it. Avoid stories at the end. 3. Q&As - Take questions all the time. Acknowledge good questions posed by the audience. An ideal technique for trainers & teachers who make long presentations is to reward students who ask intelligent questions. This will ensure students pay complete attention. 4. Make the audience dance - Make your audience shout, stand or write something. Seek a volunteer or a show of hands. Make them do some activity. The last time I heard Stephen Covey in Hyderabad he made audiences stand, shout "hee haw" and write down a few things. This engages the audience very well. 5. Use relevant videos - Videos breaks the monotony and explain your point well. You must use videos when you have a long presentation. Do not use two videos back to back. 6. Repeat important stuff - Repeating important stuff does not mean keep saying the same thing again and again. It means you link back every idea to the core message. This helps recall. 7. Use images - Text has a soporific effect on the audience. To keep them awake use images. Images that supplement the idea. A good image reinforces understanding. 8. Use props - This is my favorite tool. Using a prop well makes it very dramatic for the audience. If you are talking of conserving water, how about pouring a glass of water on the stage and asking the audience "Do you want to continue wasting water." This is better than saying "Please do not waste water.". 9. Ask a question - Who says only the audience can ask questions? Trainers and teachers use this technique all the time to gauge the level of audience understanding. Why don't you use this in your next presentation? 10. Be enthusiastic - Enthusiasm is contagious. Be passionate and the audience will love you.Your body language is a precursor of how your presentation is going to be. Start with a smile and maintain eye contact with the audience. You need not use each of these 10 tools in every presentation. Depending on your objective and your comfort level choose your tools of engagement. If you are not a story teller, try out props or make the audience dance. 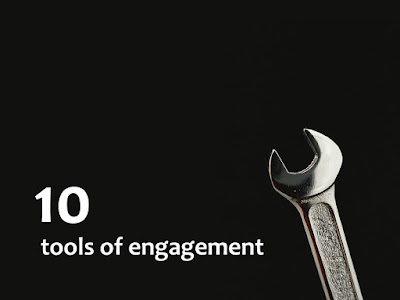 Which of these 'tools of engagement' are you already using? Which are the tools you would like to adopt? Drop in a comment.